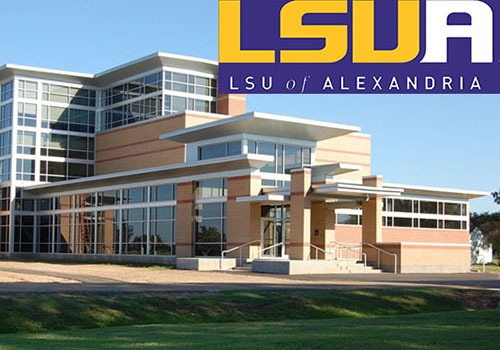 Completed in 2011, the 72,000 square-foot Multipurpose Academic Building (MPAC) on the LSUA campus is dedicated to multipurpose academic activities and includes a variety of classrooms, faculty offices and conference rooms. The difference between success and failure is a great team — and nowhere is that more evident than on the campus of Louisiana State University at Alexandria (LSUA). When it began its partnership with LSU at Alexandria to manage the campus bookstore, Barnes & Noble College had a tried-and-true manager in mind to take the helm. Erin Weilbaecher, who had seven years experience at the Barnes & Noble at LSU bookstore on the main campus in Baton Rouge, shined in her previous roles as she rose through the ranks. “Like many students, she was a Barnes & Noble employee who really liked the experience,” recalls Barnes & Noble at LSU General Manager Paul Stevenson. “Upon graduation, we had an opening for an assistant textbook manager and we offered her the opportunity.” Two years later, when a position as café manager opened, she took on the challenge to great success, leading one of the largest volume cafés in the company. 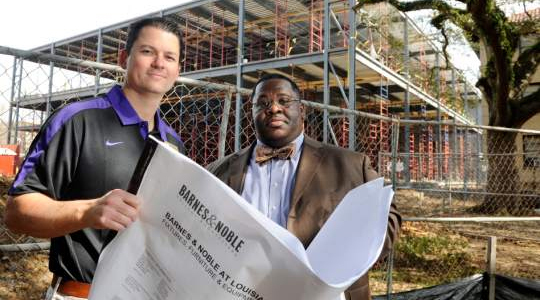 Barnes & Noble at LSU General Manager Paul Stevenson stands with LSU’s Director of University Auxiliary Services Jason Tolliver in front of the main campus bookstore in Baton Rouge at the time of its construction. To meet LSUA’s goal of opening before B-Term Courses, the bookstore team, comprised of seven managers and students from the main campus, “put boots on the ground,” according to Stevenson — closing the store on June 19 and reopening just five days later on June 23. On opening day, students found plenty to explore, including new merchandise that has been updated to adhere to LSU’s recent re-branding. In addition to the expanded clothing selection, the convenience area is 50 percent larger than before; the new ‘Heat and Eat’ section and ice cream freezer are also especially popular. “There are options to eat on the go, like mac and cheese and noodle bowls. They present new meal options for students that they didn’t have before,” Weilbaecher explains. The design of the store was also modified to better meet the needs of the students, with school supplies moving to the back wall where they are more easily accessible. “We feel the new layout is more student friendly and presents a better shopping experience for the campus,” Stevenson said.